QUETTA, Aug 04 (APP): President Mamnoon Hussain on Thursday said Balochistan was on the road to prosperity as after completion of China Pakistan Economic Corridor (CPEC) projects, a new era of economic and social development would commence in the province. He was talking to Balochistan Governor Muhammad Khan Achakzai and Chief Minister Nawab Sanaullah Khan Zehri, who called on him here at the Governor House. 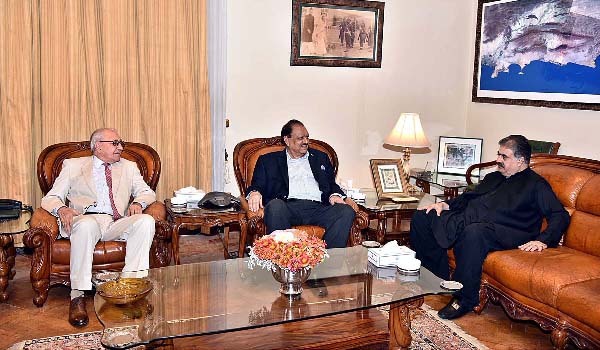 The President expressed satisfaction over the improved law and order situation in Balochistan, saying the miscreants would be dealt with strictly. “No stone will be left unturned in establishing peace and development in Balochistan,” he added. President Mamnoon said the CPEC projects, up-gradation of Gwadar deep seaport, Gwadar Port Expressway and Gwadar International Airport would ensure economic development in the province and create immense employment opportunities. The government, he said, was committed for timely completion of all the ongoing development projects in Balochistan to bring it at par with other provinces. President Mamnoon appreciated the provincial government for serving the people of Balochistan and emphasized that the development projects should be continuously monitored to ensure transparency and high standard. “Transparency and high standard should be ensured in the ongoing projects at any cost,” he stressed. The Governor and the Chief Minister thanked the President for taking keen inertest in the development of Balochistan and briefed him on the overall situation and implementation of development projects throughout the province. They appreciated the federal government for extending cooperation and ensuring provision of all facilities in ensuring development in the province.